"Horses change lives. They give our young people confidence and self-esteem. They provide peace and tranquility to troubled souls. Stampede of Dreams "SOD" is a program established in 2009 to provide quality Equine Assisted Horseback Riding Lessons which provides therapeutic benefits for children and adults with special needs. We serve Huron County and surrounding areas. 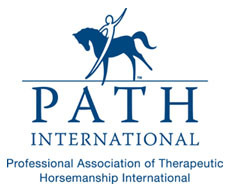 Stampede of Dreams is a member of PATH - Professional Association of Therapeutic Horsemanship International. To use the therapeutic benefit of horses, the compassion and dedication of our volunteers to provide individuals with special abilities the opportunity to experience their own personal healing and to reach their fullest potential. Join Us for 2019 Volunteer Training! Stampede of Dreams 2019 Volunteer Training and Renewal session will be held Tuesday, March 19th at 6PM, EagleCreek Golf Course (2406 New State Road Norwalk, Ohio). If you have any questions, contact Jan Daniels 419-681-2532 or volunteer coordinator Diane Tkach 419-706-0920. If you would like to volunteer please contact Volunteer Coordinator Diane Tkach at 419-706-0920. Please be sure to check our FaceBook page frequently for training times, dates and up to date news about Stampede of Dreams. You do not need experience with horses to volunteer to help. All volunteers have to attend a training session before they will be able to assist with the program. Please help support us by shopping at AmazonSmile! It offers the same great service and products as amazon, except your purchases will support our riding program as Amazon donates a percentage of the price of eligible purchases to Stampede of Dreams! Show your support and click here to shop AmazonSmile! Make sure you turn up your sound! Please consider making a donation in honor of or in memory of someone to Stampede of Dreams. We have a beautiful plaque where we will honor your donation! Our clients are both adults and children. All clients are screened by Stampede of Dreams to assess if they meet the safety criteria set forth by NARHA. SOD may also request a written prescription and an approval letter from their Doctor before being accepted into the program. Muscular Dystrophy, Cerebral Palsy, Multiple Sclerosis, Visual Impairment, Spina Bifida, Down Syndrome, Mental Retardation, Autism, Learning Disabilities, Attention Deficit Disorder, Emotional Disabilities, Deafness, Brain Injuries, Spinal Cord Injuries, Amputations, Cardivascular accident, and stroke. © 2018 - 2019 Stampede of Dreams and Its Licensors. All Rights Reserved.